How can I use Inventory Control For product with Advanced Options? For products that are sold with different options (i.e. Color, Size, etc.) you might need to keep track of the stock of the item for each specific options combination. Advanced Options allow you to keep the inventory control on the option level, so when a customer orders the product with options, the inventory will be deducted from the advanced option stock. Click on the "General" tab and look towards the lower right of the page. In the Inventory Control section, check the Enable Inventory Control checkbox. Setting up the Advanced Options is described in greater detail within our Advanced Options knowledge base article. You can view the article here. Below are the basic steps. Find the the product you'd like to like to enable Advanced Options for and click on its ID or Name to open it. Click on the "Options" tab to view your options. Next, look towards the top right of the page and click on the "Actions" button to select "Advanced Otions"
Please be aware of this as there is a limit of 200 possible product combinations that your store will be able to display for Advanced Options. To specify your Advanced Options, click on each of their respective "Enable" boxes. From there, you can edit the fields available in the page. Of the available "Advanced Options" fields, Inventory Control will work directly with the "Stock" field. This field will obey whatever stock alert rules you set up for the product at its base level and notify you of when the option's inventory is low. With Advanced Options enabled and the option's Stock set to 0, your customers will not be able to buy the product with this option selection. Also, it is usually best to enable ALL advanced options for the products to ensure they can be purchased correctly. The Advanced Options for your products can be modified in batch by using the Export/Import section. 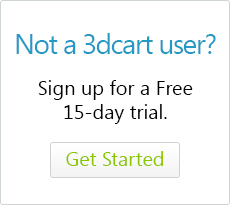 The file for importing the Advanced Options can be downloaded from the "Sample Link" located in the Products Export page of your 3dcart Online Store Manager.